I've said it before, and I'll say it again, running a profitable, handmade business is not an quick and easy task. I've been selling on Etsy since 2011, and I'm not a millionaire yet. Even though I haven't had record breaking sales in the last four years, I have been able to keep my business out of the red since day one and that feels good! Like any business, some months are better than others. For me, sales are always pretty low in the spring. (A couple weeks ago I had a day where I only had 6 views of my Etsy shop and two of those were mine.) Instead of moping through this lean time, I decided to reflect on the lessons I have learned from selling on Etsy so I can continue to grow and improve my business. Just because you list items in your shop doesn't mean you are going to immediately make sales. I waited four agonizing months before I sold anything and was just about to give up on the idea of selling my handmade items online. Sure there are some businesses that are overnight successes. There are also people that win the lottery or get struck by lightening. Those one in a million cases are the exception, not the rule. It will take time for your business to grow and become successful even if you are selling the most original, well made items. When I first opened my shop, I didn't really have a plan for what I wanted to sell. I'm an ADD crafter that sews, beads, crochets, knits... I though my shop would give me the opportunity to sell a little bit of everything. Then I started visiting other Etsy shops and it quickly became apparent to me that the more successful shops had a niche. They didn't carry a lot of different types of items (sweaters, cat toys, purses, garden art...) Instead, they had a cohesive product line that focused on one type of item, like jewelry, or one craft skill, like sewing. Looking back at some of my early product pictures, I feel a little embarrassed. I'm a crafter, not a photographer. However, to be competitive in a mega-marketplace like Etsy, you need to have decent item photos. The two tools I found to be most helpful were a tripod and photo editing software. My pictures are never blurry when I use my tripod and it gives me a the chance to really set-up my shots. Photo editing software allows me to correct for less than perfect lighting. Two easy to use and free programs that I like are Photoscape and Paint.net. Your photos bring customers to your store, but your words sell the items. Customers want to know what makes your item special. Why is your handmade necklace better than the other 100,000 necklaces on Etsy? Also, since customers can't pick-up and hold the item in their hands or try it on, like they could in a store, it is absolutely critical to include sizes, dimensions, and information about the material you used to create your item. Being an active member on a team allows you to "meet" and interact with other people, with similar challenges and goals. Team members can help answer your questions, provide feedback, are willing to help you promote your shop and may even become your life-long friends! One distinct advantage that small businesses have over huge, international manufacturers is that we have our own, unique and personal story to tell. We are artists, engineers, husbands and wives, caregivers, survivors and dreamers. Don't be shy about telling customers your inspirations, goals and struggles. People want to support others who are working hard to create their own personal success. Before I started blogging and selling on Etsy, I was off the grid. No Facebook. No Twitter. No Pinterest. In today's media based society, one of the quickest ways to spread the word about your business is through social media. You don't need to be a hero and have every type of social media account. To get started, try one or two different platforms and make sure you set up accounts that represent your business. Of course you can share your products on social media, but it's also a great platform to tell your story. Again, don't be shy to share the personal aspects of your work. A customer looking for a blanket pattern is likely going to select "home and living" not "craft supplies and tools", so I may need to rethink which categories I want to use so customers can actually find my items. I no longer sell any physical items in my shop, but when I did, I shipped them using the US Postal Service. I discovered that if you buy your postage online, it's less expensive than buying it at the post office. You just need a scale (I used a small food scale), so you can measure the weight of your packages and a ruler to measure the size. Also, if you are shipping via Priority Mail, you can schedule a pick-up so you don't even have to leave the house. Just because you have a shop on Etsy doesn't mean you can't sell your handmade items in other places, as well. There are a number of other options for selling handmade items online including, Ebay, Shopify, Dewanda, ArtFire, Zibbet and Storenvy just to name a few. There are also options for selling your items in real world places like consignment shops, craft fairs, festivals and galleries. Do you sell your handmade items online? 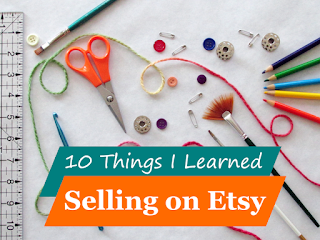 Tell me what you have learned selling on Etsy or any other online marketplace.